Brought home a set of Ruger twins. 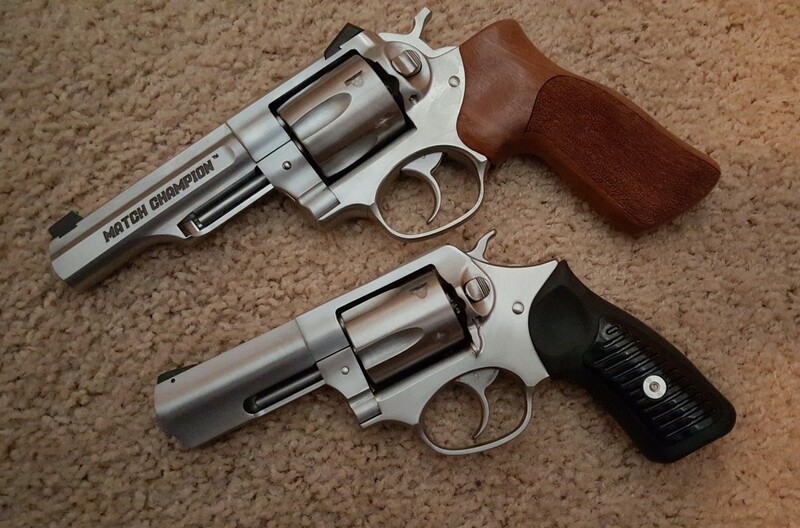 Two guns I’ve wanted for years and today I just said “Screw it… I’m getting them.” So I did. Full power .357 Magnum Goodness Gracious. I’ve not shot them yet. First, I have some work to do on them. They need some smoothing. Out of the box Rugers are not the slickest of actions or triggers. The SP101 needs a new set of grips, or inserts. Not digging them. The Match Champion is awesome. Still needs to be slicked up, but I love it. I will also need a couple good holsters. And when I say I need holsters, I only look to one source. My exclusive holster maker. I will not carry them in anything less. There’s something just… Honest about revolvers. With Autos there is so much BS when it comes to “Reliability” and chest pounding when it comes to what Elite Unit uses your gun. Revolvers just ARE. They are inherently accurate and as reliable as any gun can possibly be. They are easy to shoot well with. And dang if they don’t look good. Previous PostTired of Tantos.Next PostThe Ruger SP101. Wheelguns are filled with goodness. Don’t forget to pick up a speed loader or 2. And 357 magnum has a place close to my heart. Speed Loaders for the Match Champion. Bianchi Speed Strips for the SP101. There’s something sort of Zen about owning and carrying a revolver, IMO. I have a Ruger in my pocket right now (.357LCR). It quickly became my carry gun, because there is no need for taking off or putting on a belt holster. Drop it in the pocket, holster and all, and I’m set. If I need it, the holster will stay put when I draw. Those two will serve you well, George. I have lusted for a 4″ Security Six (1976 model, w/ the ” made in the 200th year of American Freedom” roll marks), to mate w/ my ’76 Super Black hawk and Old Army revolvers. A .22 auto from the same year would be nice, too! You gotta try it… its sweet. Care to take a stab at the comparision between the “match champion” model verses the GP-100? Owned the GP-100 for a few years now and love everything about it. But after seeing the Match Champion I’m growing antsy to buy one…….pro’s and con’s? I think that old Bill Jordan would get a twinkle in his eyes looking at the stocks on the Match Champion, they look just like the old Trooper stocks he liked to use on his model 19 Smiths. I have 5 GP100’s, a Security 6, an SP101 and a Redhawk, all in .357 Mag. They’re all outstanding revolvers. Try the Hogue rubber grip on the SP101. I have it on my Wiley Clapp inspired edition, and it’s way easier to control, even with stout 180 grain loads.